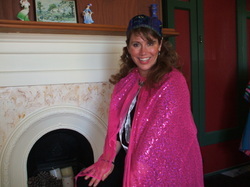 I am a dramatic storyteller in the lovely province of Marlborough, New Zealand. My specialty is Children's Interactive Entertainment for parties, schools, pre-schools, libraries and festivals. I have a storytellers' kit, which includes puppets, drums, a rain stick, and other props. I've gathered some tales to tell and have fun tweaking them to my own style! Over many years and many adventures, I have built up an extensive repertoire of tales to tell to children of all ages. From October to June, I am the resident storyteller at the Marlborough Farmers' Market, and perform every Sunday from 10 - 10:30am with tales targeted towards farms, the growing of food, healthy eating, and more. A world traveller, I was born in the USA, had my childhood in Canada and New Zealand, and also lived in England. After travelling many years, I now choose to live in Blenheim, Marlborough, New Zealand. I started as a Professional Storyteller in 2008, but have always had many tales to tell. I am a natural storyteller, and have been in demand as one all my life. After many years of people asking if they could hire me after hearing me read stories at school, playcentre, and so on. I decided 'Why not?! ', so here I am. I enjoy themes to tell to for children’s parties, schools, pre-schools, libraries, festivals and more. Contact me for more information.